Tschipey Achtu Lodge was very active for the 2012 NOAC issuing two 2-piece Fundraiser set, a 2-piece trader set and a 2-piece contingent set. 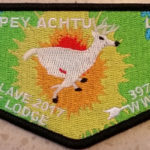 Tschipey Achtu Lodge also issued a flap as part of the Section NE-3A set. The set shared a common design with the lodge name on each flap in the series.